It is already well known that Prabhas did a lot of strenuous hard work for morethan two years for Baahubali. He even learnt rock climbing for the movie. For Dheevara Song, he was subjected to not just 'Rock Climbing' but also to 'Rope Swinging' . Here's a working shot from the song posted by darling himself on his facebook page. 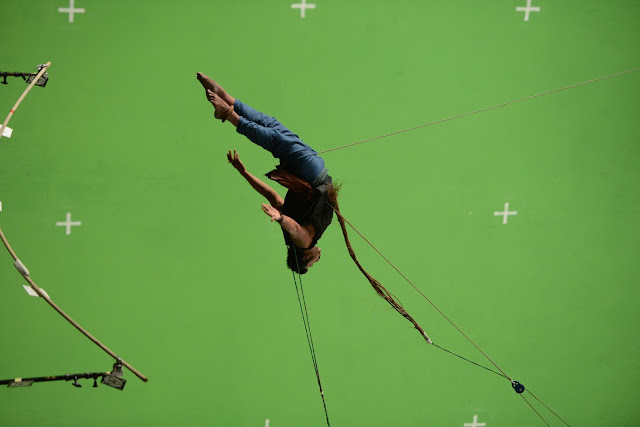 Commenting on this photo Rajamouli said "The whole unit went into a thunderous applause when Prabhas did this shot. And this was right after his shoulder surgery". Well, that's Prabhas for you. Prabhas arrives in Mahindra TUV300 TV Advt. Prabhas Mahindra TUV300 Print Advt. Prabhas shoots for Mahindra TUV300 Advertisement.